Built in 1921 as MS Ward, by Doulett and Williams, New Orleans, LA. Acquired by the Navy from the Maritime Commission, 5 February 1944 at Pearl Harbor, T.H. 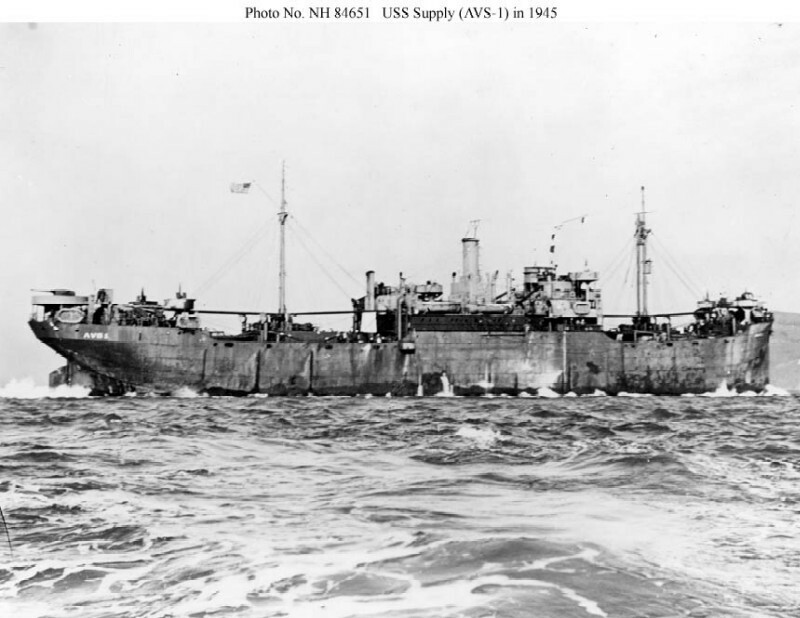 Commissioned USS Supply (IX-147), 8 February 1944, LCDR. A. J. F. Schmidt, USNR, in command. Decommissioned, 4 February 1946 and returned to the War Shipping Administration for lay up in the National Defense Reserve Fleet, Suisun Bay, Benecia, CA. two turbo-drive 340Kw 240V D.C.
one turbo-drive 35Kw 240V D.C.
99k USS Supply (AVS-1) underway, date and location unknown.